Stefan Dietze invited me to give the keynote presentation at the pre-WWW2015 workshop Linked Learning 2015 in Florence. I’ve already posted a summary of a few of the other presentations I saw, this is a long account (from my speaker’s notes) of what I said. If you prefer you can read the abstract of my talk from the WWW2015 Companion Proceedings or look through my slides & notes on Google. This is a summary of past work at Cetis that lead to our invovement with LRMI, why we got involved, and the current status of LRMI. There’s little here that I haven’t written about before, but I think this is the first time I’ve pulled it all together in this way. Lorna M. Campbell was co-author for the presentation; the approach I take draws heavily on her presentation from the Cetis conference session on LRMI. Most of the work that we have done on LRMI has been through our affiliation with Cetis. I’ll describe LRMI and what it has achieved presently. In general for this I want to keep things fairly basic. I don’t want to assume a great deal of knowledge about the educational standards or the specifications on which LRMI is based, not so much because I think you don’t know anything, but because, firstly I want to show what LRMI drew on, but also because whenever I talk to people about LRMI it becomes clear that different people have different starting assumptions. I want to try to make sure that we kind of align our assumptions. I want to start by reviewing some of what we (Lorna and I and Cetis) did before LRMI and why we got involved in it. That means talking about metadata. Mostly metadata for the purpose of resource discovery, in order to support the reuse of educational content; we want to support the reuse of educational content in order to justify greater effort going in to the creation of better content and allowing teachers to focus on designing better educational activities. 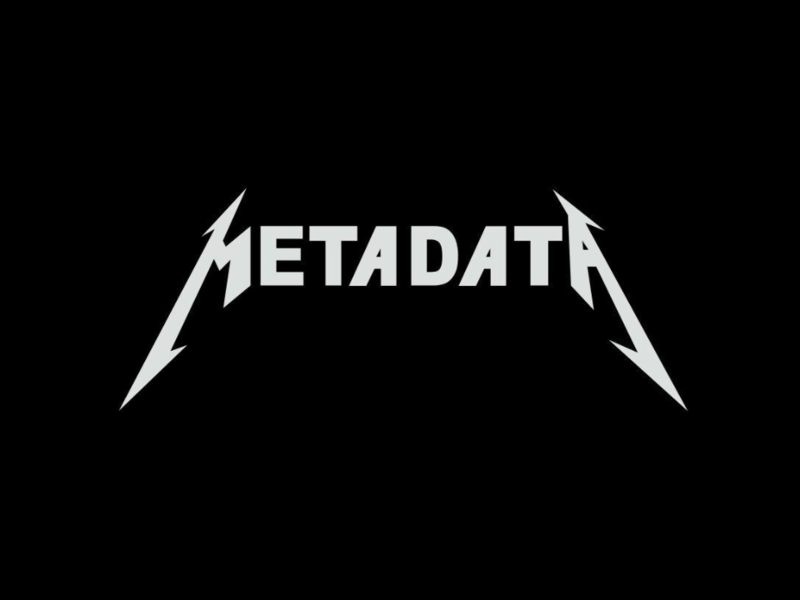 We were never interested in metadata just for its own sake, but, we felt that however good an educational resource is, if you can’t find it you can’t use it. We had nothing to do with designing the LOM. I worked on a project called FAILTE, a resource discovery service for Engineering learning resources, which involved people with various expertise (librarians, engineering educators, learning technologists) creating what was essentially a catalogue of of LOM records. These were fairly typical examples of LOM implementation work at that time. Also, none of them still exists. All these involve application profiles, that is tailoring the LOM by recommending a subset of elements to use and specifying what controlled vocabularies to use to provide values for them (see metadata principles and practicalities, section IIIA). And there’s a dilemma there, or at least you have to make a compromise, between creating descriptions which make sense in a local setting and meet local needs, and getting interoperability between different implementations of the LOM. Anyway, one way or another we got a lot of experience in the LOM and Lorna and I were also part of the team that created the IMS learning resource meta-data specification, especially the IMS Meta-data Best Practice Guide for IEEE 1484.12.1-2002 Standard for Learning Object Metadata, 2006 which is basically a set of guidelines for how to use the LOM. But I wasn’t talking about the LOM in Florence. Why not? Well, IEEE LOM and IMS Metadata have their uses, and if they work for you that’s great. But I’ve also mentioned some of the problems that we faced when we tried to implement the LOM in more or less open systems: lots of effort to create each record, compromise between interoperability and addressing specific requirements. The structure of the LOM as a single XML tree-like metadata record comprising all the information about a resource does little to help you get around these problems. It also means that the standard as a whole is monolithic: the designers of the LOM had to solve the problems of how to describe IPR, technical, lifecycle issues, and others (then consider that many different resource types can be used as learning resources, and what works a technical description of a text document might not work for an image or video). Solving how to describe educational properties is quite hard enough without throwing solutions to all of these others into the same standard. So, having learnt a lot from the LOM, we moved on hoping to find approaches to learning resource description that disaggregated the problem (at both design and implementation stages) into smaller less intimidation tasks. I want to mention some work on Semantic technologies and what was then beginning to be called linked data that Cetis helped commission and were involved in through a working group aournd 2008 – 2009. The Semantic Technologies in Learning and Teaching Jisc mini-project / Cetis working group run by Thanassis Tiropanis et al out of the University of Southampton. The SemTech project aimed to raise the profile of semantic technologies in HE, to highlight what problems they were good at solving. The project included a survey of then-existing semantic tools & services used for education to discover what they were being used for. (they found 36, using a fairly loose definition of “semantic”. The “five year plan” outlined by that project is worth reflecting on. Basically it suggested that exposing more data which can be used by applications, thus encouraging more data to be released (a sort of optimistic virtuous cycle), and the development of shared ontologies which yield benefits when there you have large amounts of data (Notably, it didn’t suggest spending years locked in a room coming up with the one ontology that would encompass everything before releasing any data). Collaborative ontology building and reasoning for pedagogical ends will be more valuable if deployed over a large volume of education related linked data where the value of searching and matching is sufficiently demonstrated. Pedagogy-aware applications making use reasoning to establish learning context and to support argumentation and critical thinking over a large linked data field could be encouraged at this stage. Our first efforts outside of IEEE LOM were in the Dublin Core Education Application Profile Task Group , between about 2006-2011, attempting to work on a shared ontology. Meanwhile others (notably Mikael Nilsson, KTH Royal Inst Technology, Stockholm) worked to get LOM data in RDF. This work kind of fizzled out, but we did get an idea of a domain model for learning resources, which rather usefully separated the educationally relevant properties from all the others. 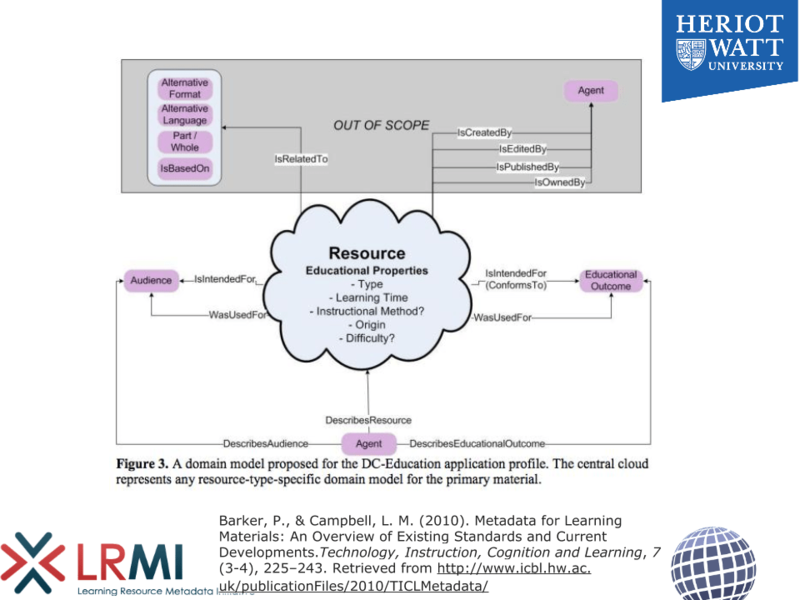 The cloud in the middle represents any resource-type specific domain model (say one for describing videos or one for describing textual resources) to which educationally relevant properties can be added. So this diagram represents what I was saying earlier about wanting to disaggregate the problem space so that we can focus on educational matters while other domain experts focus on their specialisms. I want to mention in passing that around this time (2008/9) work started at ISO/IEC on semantic representation of metadata for learning resources. This was kicked off in response to the IEEE LOM being submitted for ratification as an ISO standard… and it is still ongoing. We’re not involved. Cetis has done no more than comment once or twice on this work. In fact we did very little metadata work for a while. I thought I was done with it. At this time there was there was a an idea in educational technology circles that was encapsulated in the term #eduPunk, the idea was that lightweight personal technology could be used to support teaching and learning, a sort DIY approach to learning technology, without the constraints of large institutional, enterprise level systems–WordPress instead of the VLE, folksonomies instead of taxonomies. 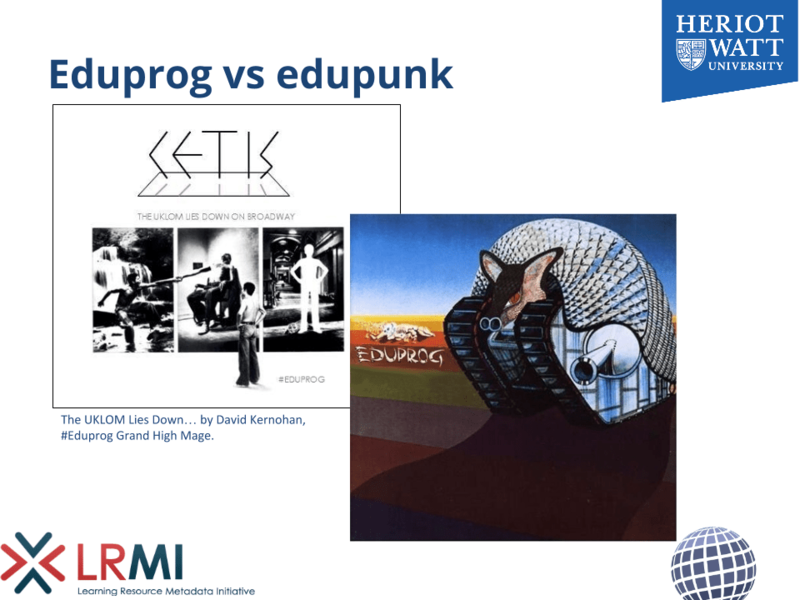 In comparison to eduPunk, we were #eduProg. I’ve nothing against the virtuoso wizardry of ProgRock or a technically excellent OWL ontology, and I am not saying there is anything wrong in either. The point I am trying to make is that the interest and attention, the engagement from the Ed Tech community was not in EduProg. The attention and engagement was in Open Educational Resources, and we supported a UK HE 3 year, £15Million programme around the release of HE resources under creative commons licences [UKOER]. Cetis provided strategic technical advice and support to the funder and to the 66 projects that released over 10,000 resources. The support include guidelines on technology approaches to the management, description and dissemination of OERs; the guidelines we gave were for lightweight dissemination technologies, minimal metadata, and putting resources where they could be found. We reflected at length on the technology approaches taken by this programme in our book Into the wild – Technology for open educational resources. We recognise the shortcomings in this approach, it’s not perfect, and some people were quite critical of it. If we had been able to point to any discovery services that were based on the LOM or any more directed approach that were unarguably successful we would have recommended it, but it seemed that Google and the open web was at least as successful as any other approach and required less effort on the part of the projects. Partly through UKOER we did see 10,000 resources and more importantly a change in culture so that using social sharing site for education became unremarkable, an I would rather have that than a few 100 perfect metadata descriptions in a repository. make sure the resource has a good textual description and is findable on Google. 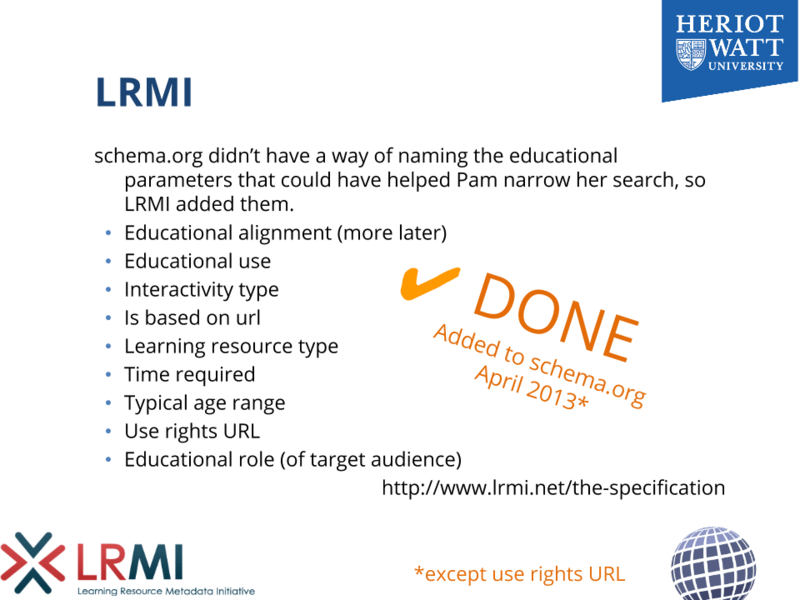 LRMI launched in 2011. what about it got us back into educational metadata? Let’s start from first principles, and look at the motivation behind LRMI, which is to help people find resources to meet their specific needs. I’ll try to illustrate this. Meet Pam, a school teacher. Let’s say she wants to teach a lesson about the Declaration of Arbroath. What are her specific needs? Well, they relate to her students: their age, their abilities; to her teaching scenario: is she looking for something to use as part of a half hour lesson on a wider topic, or something that will provide a plan of work over a few lessons? introduction or revision? And there is the wider context, she’s unlikely to be teaching about the declaration of Arbroath for its own sake, more likely it will relate to some aspect of a wider curriculum, perhaps history but perhaps also something around civic engagement in Scotland, or relations between Scotland and England, or precursors to the US declaration of independence, but she will be doing so because she is following some shared curriculum or exam syllabus. She searches Google, finds lots of resources, many of them are no more than the text of the resource. There are also tea towels and posters. Those that go further do not necessarily do so in a way that is suitable for her pupils. There’s a Wikipedia article but that’s not really written with school children in mind. 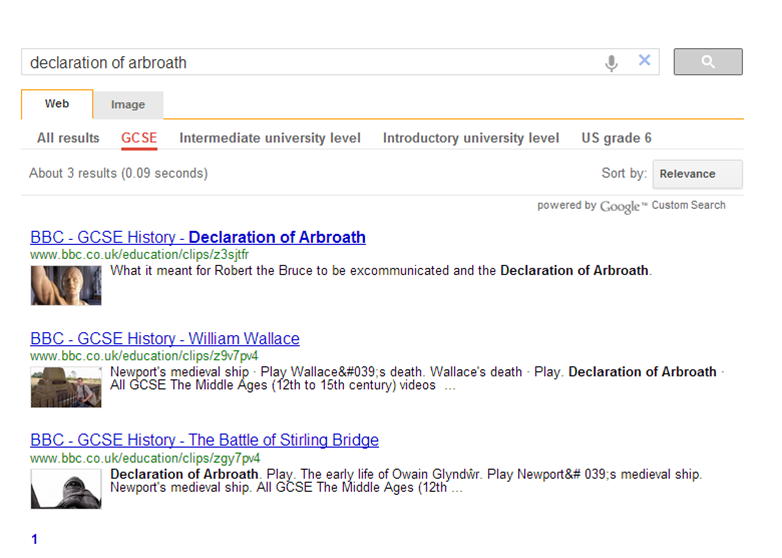 Google doesn’t really support narrowing down Pam’s search to match her requirements such as the age and educational level of students, the time required to use in a lesson, the relevance to requirements of national curriculum or exam syllabus, so Pam is forced to look at a series of separate search services based (often) on siloed metadata [examples 1, 2, 3]. It’s worth noting that the examples show categorisation by factors such as Key Stage (i.e. educational level in the English National Curriculum), educational subject, intended educational use (e.g. revision) and others, giving hints as to what Pam might use to filter her search. Google (historically) hasn’t been especially good at this sort of filtering, partly because it cannot always work out the relevance of the text in a document. a joint effort, in the spirit of sitemaps.org, to improve the web by creating a structured data markup schema supported by major search engines. An agreed hierarchy of entity types (see right). An agreed vocabulary for naming the characteristics of resources and the relationships between them. Which can be added to HTML (as microdata, RDFa or JSON-LD) to help computers understand what the strings of text mean. An entity – relation graph identifying the types of entities, their relationships to each other and to the strings that describe significant properties. At this point the LRMI was initiated, a 3 year project funded by the Bill and Melinda Gates foundation (and later wth some additional funding from the Hewlett Foundation), managed jointly by one organisation committed to open education (Creative Commons) and another (AEP) from the commercial publishing world, with input from education,publishers and metadata experts. I was on the technical working group. We issued a call for participation; gathered use cases; and did the usual meeting and discussing to hammer out how to meet those use cases. We worked more or less in the open,–there was an invitation only face to face meeting near the beginning (limited funding so couldn’t invite everyone) after that all the work was on open email discussion lists and conference calls. Basing the work on schema.org allowed us to leave all the generic and resource-format specific stuff for other people to handle, and we could focus just on the educational properties that we needed. The slide on the left shows what came out. The first two properties are major relationships to other entities, and alignment to some educational framework and the intended audience, the others are mostly simple characteristics. All are defined in the LRMI specification. In a previous blog post I have attempted further explanation of the Alignment Object. Most of these were added to Schema.org in 2013, the link to licence information was added later. Current state of LRMI and future plans. LRMI has been implemented by a number of organisations, some with project funding to encourage uptake, others more organically. One of the nice things about piggy-backing on schema.org is that people who have never heard of LRMI are using it. Not every organisation on this list exposes LRMI metadata in its webpages, some harvest it or create it and use it internally. The Learning Registry is especially interesting as it is a data store of information about learning resources in many different schema, which uses LRMI as JSON-LD for (many of its) descriptive records. We have reported in some depth on the various ways in which LRMI has been implemented by those projects who are funded through the initiative. We can create a Google custom search engine that looks for the alignment object–this in itself is a good indicator that someone has considered the resource to be useful for learning; and we can add filters to find learning resources useful for specific contexts, in this case different educational levels. This helps Pam narrow down her search–at least in a proof of concept way, as they stand these are not intended to be useful services. they exist. That’s a good first step. not every implementation exposes LRMI metadata, some use it internally. schema.org is a lightweight, loose ontology, implementation is looser. there is no agreement on value spaces, either terms or meanings (e.g. educational level, 1st Grade, Primary 1). The Gates funding for LRMI is now complete, and as an organization LRMI is now a task group of the Dublin Core Metadata Initiative. That provides us with with the mechanisms and governance required to maintain, promote, and if necessary extend the specification. It does not mean that LRMI terms are DC terms, they’re not, they’re in a different namespace. DCMI is more than a set of RDF terms, it’s a community of experts working together, and that’s what LRMI is part of. The LRMI specification is now a community specification of DCMI, conforming to the the requirements of DCMI, such as having well-maintained definitions in RDF, which align with the schema.org definitions but are independently extensible. contributing via new schema.org extension mechanism? Does this help with the endeavour to expose lightweight linked data? How do we encourage linked data representation of educational frameworks? 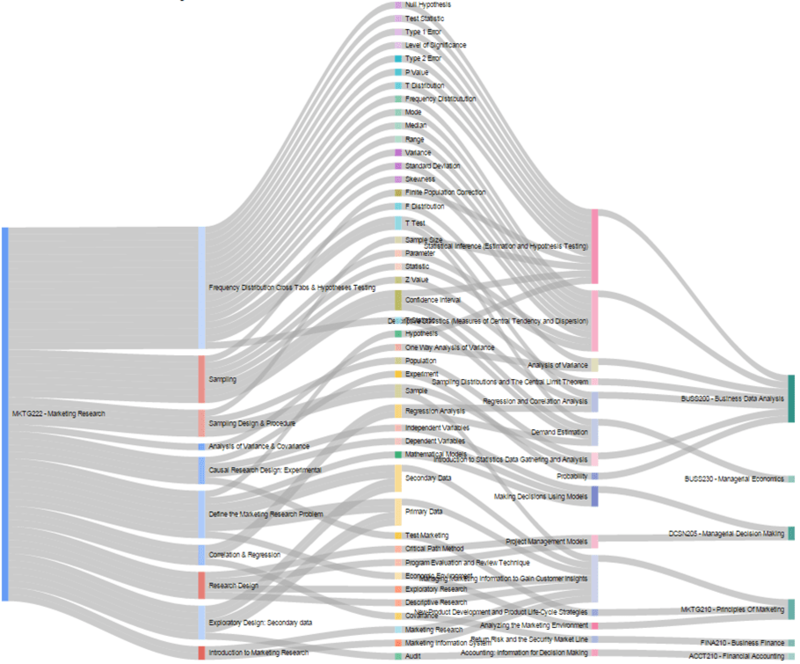 How much goes into schema.org (or similar) or should we just reuse existing ontologies? Can you cope with the the quality of data that can be provided at web-scale? As far as I could judge from the questions that I couldn’t answer well, the weak points in the presentation, or in LRMI may be, seem to be around gauging the level of uptake: how many pages are there out there with LRMI data on them? I don’t know. The schema.org pages for each entity show usage , for example the Alignment Object is on between 10 and 100 domains, but I do not know the size of those domains. That also misses those services that use LRMI and do not expose it in their webpages but would expose it as linked data in some other format. I suspect uptake is less than I would like, and I would like to see more. As presenter I was happy that even after I had talked about all that for about 45 minutes, there were people who wanted to ask me questions (the forestalling tactic didn’t work), and even after that there were people who wanted to talk to me instead of going for coffee. That seems to be a good indicator that there was interest from the workshop’s audience. 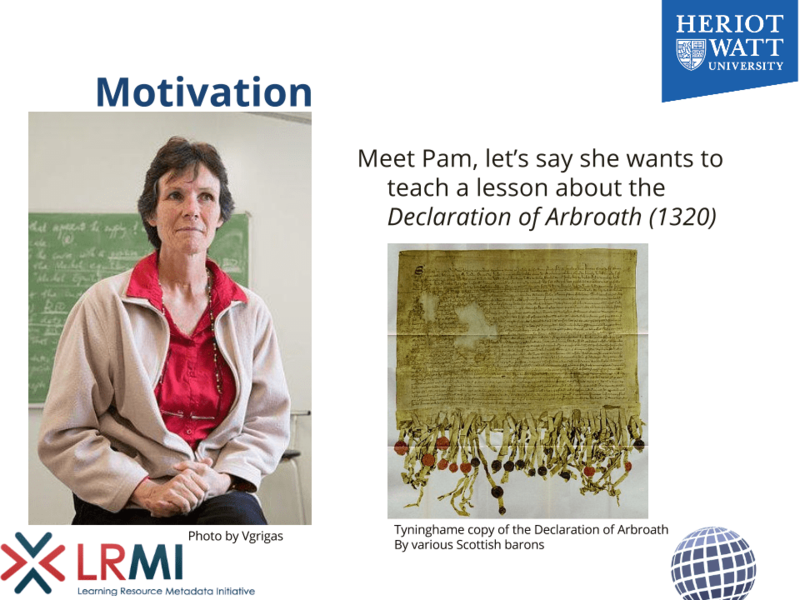 Image credits: Photo of Pam Robertson, teacher, by Vgrigas (Own work) [CC-BY-SA-3.0 ], via Wikimedia Commons; reproduction of Tyninghame (1320 A.D) copy of the Declaration of Arbroath, 1320, via Wikimedia Commons. Logos (Heriot-Watt, Cetis, LRMI, Semtech etc.) are property of the respective organisation. Unless noted otherwise on slide image, other images created by the authors and licensed as CC-BY. We are currently preparing some examples of LRMI metadata. While these are intended to be informative only, we know that they will affect implementations more than any normative text we could put into a spec–I mean what developer reads the spec when you can just copy an example? So it’s important that the examples are valid, and that set me to pulling together a list of tools & services useful for validating LRMI, and by extension schema.org. simple syntax errors produced by typos, not closing tags and so on. using properties that don’t belong to the stated resource type, e.g. educationalRole should be a property of EducationalAudience not of CreativeWork. loose or strict interpretation of expected value types, e.g. the author property should have a Person or Organization as its value, dates and times should be in iso 8601 format? is the data provided for properties from the value space they should be? i.e. does the data provider use the controlled vocabulary you want? See also Structured Data Markup Visualization, Validation and Testing Tools by Jarno van Driel and Aaron Bradley. If Google is your target this is as close to definitive as you can get. You can validate code on a server via a URL or by copying and pasting it into a text window, in return you get a formatted view of the data Google would extract. Downsides: it used to be possible to pass the URL of the code to be validated as a query parameter appended to the testing tool URL and thus create a “validate this page” link, but that no longer seems to be the case. Also, the testing tool reproduces Google’s loose interpretation of the spec, and will try to make the best sense it can of data that isn’t strictly compliant. 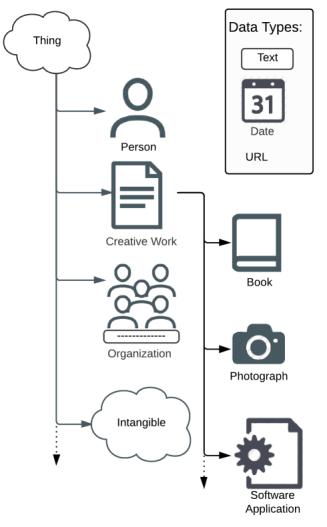 So where the author of a creative work is supposed to be a schema.org/Person if you supply text, the validator will silently interpret that text as the name of a Person entity. Also dates not in ISO 8601 format get corrected (October 4 2012 becomes 2012-10-4 That’s great if your target is as forgiving as Google, but otherwise might cause problems. But the biggest problem seems to be that pretty much any syntactically valid JSON-LD will validate. Similar to the Google testing tool, but with slightly larger scope (validates OpenGraph and microformats as well as schema). Not quite as forgiving as Google, a date in format October 4 2012 is flagged as an error, and while text is accepted as a value for author it is not explicitly mapped to the author’s name. Unlike the Google testing tool you do get an appropriate error message if you correct the @vocab URI to have a lower-case S, making this the best JSON-LD validator I found. Downsides: requires registration and signing-in so I didn’t try it. A useful feature of the validators listed above is that they produce something that is human readable. If you would like this in the context of the webpage, Paul Libbrecht has made a highlighter, a little bookmarklet that transforms the schema.org markup into visible paragraphs one can visually proof. Not validators as such, but the following will attempt to read microdata, RDFa or JSON-LD and so will complain if there are errors. Additionally they may provide human readable translations that make it easier to spot errors. “RDF Translator is a multi-format conversion tool for structured markup. It provides translations between data formats ranging from RDF/XML to RDFa or Microdata. The service allows for conversions triggered either by URI or by direct text input. Furthermore it comes with a straightforward REST API for developers.” …and of course is your data isn’t valid it won’t translate. Validates pretty much any RDF / microdata format you care to name, either by entering text in a field or by reference via a URI. Downsides: again purely syntactic checking, doesn’t check whether the code is valid schema.org markup. Produces a nicely formatted, human readable representation of structured data. Validates: HTML + microdata, HTML + RDFa either by URL, file upload or direct input. Downsides: another that is purely syntactic. A really useful tool for automatically simplifying or complexifying JSON-LD, but again only checks for syntactic validity. “A Tool to help import the content of the Learning Registry into a data store of your choice” I haven’t tried this but it does attempt to parse JSON-LD so you would expect it to complain if the code doesn’t parse. A colleagues at Heriot-Watt has had students working (with input from Eric Pud’Hommeaux) on Validata “an intuitive, standalone web-based tool to help building valid RDF documents by validating against preset schemas written in the Shape Expressions (ShEx) language.” It is currently set up to work to validate linked data against some pre-set application profiles used in the pharmaceuticals industry. With all the necessary caveats about it being student work, no longer supported, using an approach that is preliminary to the W3C working group, this illustrates how instance validation against a description of an application profile would work. I was lucky enough to go to Florence for some of the pre WWW2015 conference workshops because Stefan Dietze invited me to talk at the Linked Learning workshop “Learning & Education with the Web of Data“. Rather than summarize everything I saw I would like to give brief pointers to three presentations from that workshop and the “Web-base Education Technologies” (WebET 2015) workshop that followed it that were personal highlights. Many thanks to Stefan for organizing the conference (and also to the Spanish company Gnoss for sponsoring it). I’ve followed the work on Tin Can / xAPI / Experience API since its inception. Lorna and I put a section about it into our Cetis Briefing on Activity Data and Paradata, so I was especially interested in Tom De Nies‘s presentation on TinCan2PROV: Exposing Interoperable Provenance of Learning Processes Through Experience API Logs. Tin Can statements are basically elaborations of “I did this,” providing more information about the who, how and what referred to by those three words. Tom has a background in provenance metadata and saw the parallel between those statements and the recording of actions by agents more generally, and specifically with the model behind the W3C PROV ontology for recording information about entities, activities, and people involved in producing a piece of data or thing. Showing that TinCan can be mapped to W3C PROV is of more than academic interest: the TinCan spec provides only one binding, JSON but the first step of Tom’s work was to upgrade that to JSON-LD and then through the mapping to PROV allow any of the serializations for PROV to be used (RDF/XML, N3, JSON-LD), and to bring the Tin Can statements into a format that allows them to be used by semantic technologies. Tom is hopeful that the mapping is lossless, you can try it yourself at tincan2prov.org. I also have an increasing interest in the semantic representation of courses, there’s some interest in adding Courses to schema.org, but also within my own department some of us would like to explore advantages of moving away from course descriptors as PDF documents to something that could be a little more connected with each other and the outside world. Fouad Zablith’s presentation on Interconnecting and Enriching Higher Education Programs using Linked Data was like seeing the end point of that second line of interest. The data model Fouad uses combines a model of a course with information about the concepts taught and the learning materials used to teach them. Course information is recorded using Semantic MediaWiki to produce both human readable and linked data representations of the courses across a program of study. A bookmarklet allows information about resources that are useful for these courses to be added to the graph–but importantly attached via the concept that is studied, and so available to students of any course that teaches that concept. Finally, on the topic of several courses teaching the same concepts, sometimes such repetition is deliberate, but sometimes it is unwanted. One view of a course (that makes especial sense to anyone who thinks about etymology) is that it is a learning pathway, and one view of a pathway is as an Directed Acyclic Graph, i.e. an ordered route through a series of resources. In the WebET workshop, Andrea Zielinski presented A Case Study on the Use of Semantic Web Technologies for Learner Guidance which modelled such a learning pathway as a directed graph and represented this graph using OWL 2 DL. The conclusion to her paper says “The approach is applicable in the Semantic Web context, where distributed resources often are already annotated according to metadata standards and various open-source domain and user ontologies exist. Using the reasoning framework, they can be sequenced in a meaningful and user-adaptive way.” But at this stage the focus is on showing that the expressivity of OWL 2 DL is enough to represent a learning pathway and testing the efficiency of querying such graphs. 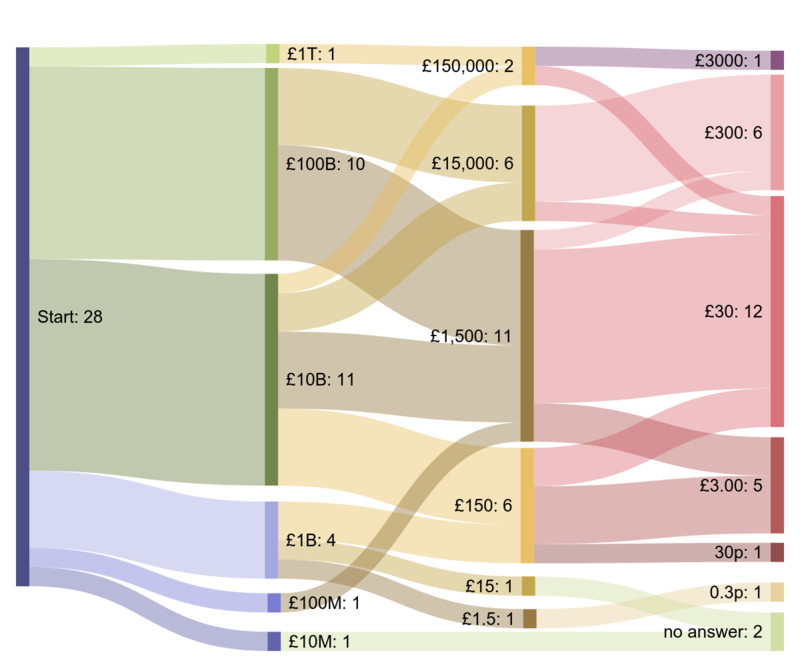 I came across an exercise that aimed to demonstrate that numbers are easier to understand when broken down and put into context, it’s one of a number of really useful resources for the general public, journalists and teachers from the Royal Statistical Society. The idea is that large numbers associated with important government budgets–you know, a few billion here, a few billion there, pretty soon you’re dealing with large numbers–but such large numbers are difficult to get our heads around, whereas the same number expressed in a more familiar context, e.g. a person’s annual or weekly budget, should be easy to understand. I wondered whether that exercise would work as an in-class exercise using socrative,–it’s the sort of thing that might be a relevant ice breaker for a critical thinking course that I teach. A brief aside: Socrative is a free online student response system which “lets teachers engage and assess their students with educational activities on tablets, laptops and smartphones”. The teacher writes some multiple choice or short-response questions for students to answer, normally in-class. I’ve used it in some classes and students seem to appreciate the opportunity to think and reflect on what they’ve been learning; I find it useful in establishing a dialogue which reflects the response from the class as a whole, not just one or two students. So did it work? What I was hoping to see was the initial answers being all over the place, but converging on the correct answer, that is not so many chosing £10B per annum for Q1 as £30 per person per week for the last question. That’s not really what I’m seeing. But I have some strange friends, a few people commented that they knew the answer for the big per annum number but either could or couldn’t do the arithmetic to get to the weekly figure. Also it’s possible that the question wording was misleading people into thinking about how much would it cost to treat a person for week in an NHS hospital. Finally I have some odd friends who are more interested in educational technology than in answering questions about statistics, who might just have been looking to see how socrative worked. So I’m still interested in trying out this question in class. Certainly socrative worked well for this, and one thing I learnt (somewhat by accident) is that you can leave a quiz running in socrative open for responses for several months. Today was spent at a QAA Scotland event which aimed to identify and share good practice in assessment and feedback, and to gather suggestions for feeding in to a policy summit for senior institutional managers that will be held on 14 May. I’ve never had much to do with technology for assessment, though I’ve worked with good specialists in that area, and so this was a useful event for catching up with what is going on. The first presentation was from Gill Ferrell on electronic management of assessment. She started by summarising the JISC assessment and feedback programmes of 2011-2014. An initial baseline survey for this programme had identified practice that could at best be described as “excellent in parts” but with causes for concern in other areas. There were wide variations in practice for no clear reason, programmes in which assessment was fragmentary rather than building a coherent picture of a student’s capabilities and progress, there not much evidence of formative assessment, not much student involvement in deciding how assessment was carried out, assessments that did not reflect how people would work after they graduate, policies that were more about procedures than educational aims and so on. Gill identified some of the excellent parts that had served as staring points for the programme–for example the REAP project from CAPLE formerly at Strathclyde University–and she explained how the programme proceeded from there with ideas such as: projects agreeing on basic principles of what they were trying to do (the challenge was to do this in such a way that allowed for scope to change and improve practice); projects involving students in setting learning objectives; encouraging discussion around feedback; changing the timing of assessment to avoid over-compartmentalized learning; shifting from summative for formative assessment and making assessment ipsative, i.e. focussing on comparing with the students past performance to show what each individual was learning. A lifecycle model for assessment from Manchester Metropolitan helped locate some of the points where progress can be made. Assessment lifecycle developed at Manchester Metropolitan University. Source: Open course on Assessment in HE. Steps 5, “marking and production of feedback” and 8 “Reflecting” were those were most help seemed to be needed (Gill has a blog post with more details). The challenges were all pedagogic rather than technical; there was a clear message from the programme that the electronic management of assessment and feedback was effective and efficient. So, Jisc started scoping work on the Electronic Management of Assessment. A second baseline review in Aug 2014 showed trends in the use of technology that have also been seen in similar surveys by the Heads of eLearning Forum: eSubmission (e.g. use of TurnItIn) is the most embedded use of technology in managing assessment, followed by some use of technology for feedback. Marking and exams were the areas where least was happening. The main pain points were around systems integration: systems were found to be inflexible, many were based around US assumptions of assessment practice and processes, and assessment systems, VLEs and student record systems often just didn’t talk to each other. Staff resistance to use of technology for assessment was also reported to be a problem; students were felt to be much more accepting. There was something of an urban myth that QAA wouldn’t permit certain practices, which enshrined policy and existing procedure so that innovation happened “in the gaps between policy”. The problems Gill identified all sounded quite familiar to me, particularly the fragmentary practice and lack of systems integration. What surprised most was the little uptake of computer marked assessments and computer set exams. My background is in mathematical sciences, so I’ve seen innovative (i.e. going beyond MCQs) computer marked assessments since about 1995 (see SToMP and CALM). I know it’s not appropriate for all subjects, but I was surprised it’s not used more where it is appropriate (more on that later). On computer set exams, it’s now nearly 10 years since school pupils first sat online exams, so why is HE so far behind? Katrin Uhilg and Anna Rolinska form the University of Glasgow about the use of wikis (or other collaborative authoring environments such as Google Docs) for learning oriented assessment in translations. The tutor sets a text to be translated, students work in groups on this, but can see and provide feedback on each other’s work. They need to make informed decisions about how to provide and how to respond to feedback. I wish there had been more time to go into some of the practicalities around this. Jane Guiller of Glasgow Caledonian had students creating interactive learning resources using Xerte. They provide support for the use of Xerte and for issues such as copyright. These were peer assessed using a rubric. Students really appreciate demonstrating a deep understanding of a topic by creating something that is different to an essay. The approach also builds and demonstrates the students digital literacy skills. There was a mention at the end that the resources created are released as OERs. Lucy Golden and Shona Robertson of the University of Dundee spoke about using on wordpress blogs in a distance learning course on teaching in FE. Learners were encouraged to keep a reflective blog on their progress; Lucy and Shona described how they encouraged (OK, required) the keeping of this blog through a five-step induction, and how they and the students provided feedback. These are challenges that I can relate to from asking students on one of my own course to keep a reflective blog. Each one of these four case studies contained something that I hope to use with my students. The final plenary was Sally Jordan who teaches physics at the Open University talking about computer marked assessment. Sally demonstrated some of the features of the OU’s assessment system, for example the use of a computer algebra system to make sure that mathematically equivalent answers were marked appropriately (e.g. y = (x +2)/2 and y = x/2 + 1 may both be correct). Also the use of text analysis to mark short textual answers, allowing for “it decreases” to be marked as partially right and “it halves” to be marked as fully correct when the model answer is “it decreases by 50%”. This isn’t simple key word matching: you have to be able to distinguish between “kinetic energy converts to potential energy” and “potential energy converts to kinetic energy” as right and entirely wrong, even though they have the same words in them. These are useful for testing a student’s conceptual understanding of physics, and can be placed “close to the learning activity” so that they provide feedback at the right time. B) talk to each other. Share the load of developing questions, share the questions (make them editable for different contexts). So, although I haven’t worked much in assessment, I ended up feeling on familiar ground, with an argument being made for one form of Open Education or another. A while back I went to the OER annotation summit where I learnt about hypothes.is, a tool for adding a layer of annotation on top of the web. If the idea of annotating the web sounds like one of those great ideas that has been tried a dozen times before and never worked, then you’re right and (importantly) the hypothes.is team know about it. It’s also one of the great ideas that is worth trying over and again because of its potential. Today I took a quick look at how they’re getting on, and it looks good. I installed the Chrome extension and registered, it took about 2 minutes, so I don’t mind if you try it right now. That gives me a small icon on my browser that activates a sidebar (which is collapsed by default) for annotations. This lets you add comments to the page, highlight sections of text, add comments to those highlights, and view other people’s highlights and comments on that page. Annotations can be private, only visible to the annotator, or public and visible to everyone. Where annotations are public it is possible to reply to them, leading to conversations and discussions. There’s also a WordPress plugin which adds annotation functionality to individual websites, I haven’t looked at that, but it could be a very useful addition to the WordPress for education tool kit. I was worried that comments on specific phrases might be fragile, breaking if the page was changed, but a bit of experimenting showed they are reasonably robust, surviving small edits to the text annotated and changes to the preceding text that had the effect of shifting the annotated text down the page. I’m sure you can break it if you try but I think their fuzzy anchoring works for reasonable cases. I like hypothes.is because it has the capacity make all the static content on web into the focus of reflective and social activity for education. Whether such activities are manageable and scaleable I don’t know,–how many open conversations can you have going on around around a single web page before everything just becomes swamped?–how many annotations can you save before finding your notes becomes harder than finding the content again. If there are limits, I guess that reaching them would be a nice problem to have. I also like hypothes.is because it is an open project.I don’t just mean that it allows the content of annotations to be shared creating open discussion, though it does, an I like that. I don’t just mean that it works on the open web rather than within the confines of a single site, though it does, and I like that. I just don’t mean that it’s Open Source, though it is, and I like that. And I just don’t mean that it’s supporting open standards, though it is, and I like that. What I really like is the openness in discussing the projects goals, approaches, plans that can be found on the project wiki and blog. A question: does WordPress have anything like the Long Term Stability branches of Ubuntu? The Cetis website is based on WordPress, we use it as a blogging platform for our blogs, as a content management system for our publications and as a bit of both for our main site. It’s important to us that our installation (that is the WordPress core plus a variety of plugins, widgets and themes) is stable and secure. To ensure security we should keep all the components updated, which not normally a problem, but occasionally an update of WordPress or one of the plugins causes a problem due an incompatibility or bug. So there is a fair amount of testing involved whenever I do an update on the publications site, and for that reason I tend to do updates periodically rather than as soon as a new version of each component is released. Last month was fairly typical, I updated to the latest version of WordPress and updated several plugins. Many of the updates were adding new functionality which we don’t really need, but there were also security patches that we do need–you can’t have one without the other. One of the plugins had a new dependency that broke the site, David helped me fix that. Two days later I login and half the plugins want updating again, mostly with fixes to bugs in the new functionality that I didn’t really need. I understand that there will always be updates required to fix bugs and security issues, but the plethora of updates could be mitigated in the same way that it is for Ubuntu. Every couple of years Ubuntu is released as a Long Term Stability version. For the next few years, no new features are added to this, it lags in functionality behind current version, but important bug fixes and security patches for existing features are back-ported from the current version. So, my question: is there anything like the concept of LTS in the WordPress ecosystem? The recently formed W3C Annotation Working Group has a joint deliverable with the W3C Web Application Working Group called “Robust Anchoring”. This deliverable will provide a general framework for anchoring; and, although defined within the framework of annotations, the specification can also be used for other fragment identification use cases. Similarly, the W3C Media Fragments specification [media-frags] may prove useful to address some of the use cases. The adoption of HTML as the vehicle for expressing publication-level metadata (i.e., using RDFa and/or Microdata for metadata like authors or title) would have the added benefits of better I18N support than XML or JSON formats. And what about application to learning? Taken in conjunction with the Annotation work starting at W3C, the scope for eTextBooks online (or whatever you want to call educational use of EPUBWeb for education) seems clear. One area that seems important for education use that seems inadequately addressed in the draft white paper is alternative presentations that would make the material remixable and adaptable to meet individual learner needs. There a little in draft about presentation control and personalization, but it rather limited: changing the font size or page layout rather than changing the learning pathway. 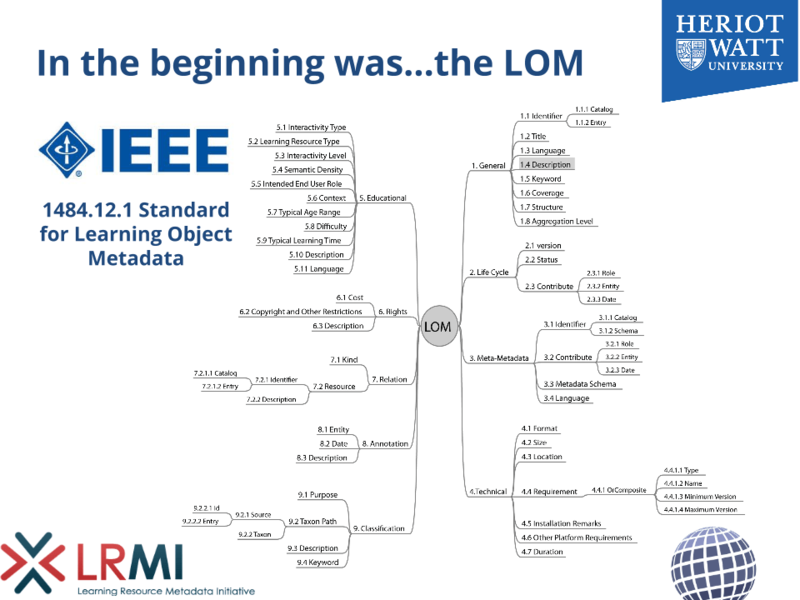 This represents the end of LRMI as a project, and the start of it as a member of the family of stable-but-evolving educational metadata specifications, one which is maintained under the governance protocols of DCMI. This does not mean that LRMI is being merged in some way with Dublin Core’s well known metadata element set or terms; DCMI is more than its specifications, it is (as it says on its website banner, with my emphasis) a metadata community “supporting innovation in metadata design, implementation and best practices”. The longstanding high regard with which the DC Metadata Element Set and DC Terms are held is testament to the care and expertise that the DCMI community devotes to specification development and curation. LRMI will now benefit from that same care and expertise. It will also benefit from representation among other educational technology and metadata specification and standardization bodies, for example through the Digital Learning Metadata Alliance. This does not mean that activity and development of LRMI will stop. It won’t (I hope), but new developments will be subject to careful scrutiny and well governed procedures leading to community acceptance. The scope and pace of new developments won’t be prescribed by project proposals, workpackages and deadlines agreed with funders, they will depend on people articulating needs and solutions that they are prepared to put effort into developing. The funding was necessary to get the initiative up and running, the funders have been great in allowing the project to be responsive and agile in ascertaining and meeting the needs of key stakeholders. The funders never dictated how the project met its aims. The project would not have reached this successful end point had that not been the case. For any initiative to continue after the initial project funding ends is a challenge, but I believe LRMI as part of DCMI is well placed to meet that challenge, now onus is on the community who use LRMI to take it forward by defining new areas for building consensus within the DCMI governance framework and by bringing new resources to this effort. Transfer to DCMI does not mean the end of the involvement of many of the individuals who have worked on LRMI in the past. The task of setting up LRMI within DCMI is being undertaken by a task group that includes Lorna M Campbell and me, extending the work that Cetis were funded to undertake in phase 3 of the funded project, Stuart Sutton, Dan Brickley, Michael Jay and Steve Midgley all of who have been active throughout the project. Beyond that, one of the reasons why DCMI was felt to be an appropriate home for LRMI is the fact that there are no barriers put in the way of anyone who wants to contribute to their work on specifications, so I hope that we will see many others who have contributed to LRMI in the past joining us. Many thanks to my colleagues at the Association of Educational Publishers, Creative Commons and the Dublin Core Metadata Initiative who have made this possible. About once a year I go to some meeting or another on libraries and eBooks. I nearly always come back from it struck by the tension between libraries, as institutions of stability, and the rapid pace at which technology companies are driving forward eBook technology. This year’s event of that type was the Scottish Library and Information Council’s 13th annual eBook conference. The keynote from Gerald Leitner, chair of the European Bureau of Library, Information and Documentation Associations task force on eBooks was especially interesting to me in introducing the Right to eRead Campaign. Leitner spoke about the ecosystem around ebooks and libraries and about the uncertainty and instability throughout the system. Can lending libraries compete with commercial lending of eBooks (Amazon kindle unlimited, £6 per month for over half a million titles)? Publishers too are threatened and are fighting, as the spat between Amazon and Hachette shows–and note, it’s not publishers who are driving the change to eBooks, it’s technology companies, notably Amazon and Apple. Libraries are at risk of being the collateral damage in this fight. And where do book lovers fit in, those who as well as reading physical books read ebooks on various mobile devices? Leitner made the point that consumers and libraries very rarely buy eBooks; you buy a limited license that allows you to download a copy and read it under certain restrictions–and no, like most people I have never bothered to read those restrictions though I am aware of the limit to the devices on which I can read that copy, that I am not allowed to lend it and that Amazon can delete copies remotely (I don’t use Apple products, but I assume they have similar terms). A consequence of this relates to the exhaustion of rights. Under copyright authors have the right to decide whether/how their work is published, and the publishers may have the right to sell books that contain the authors work. But once bought the book becomes the property of the person who bought it; the publishers rights are exhausted, they cannot longer forbid that it be resold or lent. The right to lend and resell is provided by Article 6 of the WIPO Copyright Treaty and the EU Rental and Lending directive (2006/115/EC). Library lending rights are written into statute and accompanied by remuneration for authors. Ebooks, intangible, licensed and not sold, are classed as services by the EU Information and Service Directive (2001/29/EC), and for these there is no exhaustion of rights, no right to resell or lend, and no statutory guarantee that libraries may provide access. The EBLIDA right to eRead campaign is about trying to secure a right for libraries to provide access to eBooks. The argument is that without this right to access information itself becomes privatised at the cost of an informed democracy. The campaign is asking for a statutory exemption with IP law, or mandatory fair licensing that provides libraries with the right to acquire and a right to lend.